"There is no problem, no matter how difficult it is, whether temporal or above all spiritual, in the personal life of each one of us, of our families ... that cannot be solved by the Rosary. There is no problem, I tell you, no matter how difficult it is, that we cannot resolve by the prayer of the Holy Rosary." After the Holy Sacrifice of the Mass, the Holy Rosary is the prayer most pleasing to Our Lady. In honor of the Blessed Mother, we would like to share her 15 promises to those who pray the Rosary. Mary, in virtue of her perfect union with the Passion, Death, and Resurrection of Jesus, now reigns in heaven as Queen next to her Son, Christ the King. She has been given the privilege to bestow God's graces to her spiritual children, for whom she earnestly intercedes as the Mother of all Christians. It is amazing to realize how much grace and heavenly help we can receive by an act so simple as praying the Rosary regularly. It only takes 15 minutes to pray! Set aside time alone, with your family, or with some friends to start the habit of reciting a daily Rosary. If you don't think you have time, try praying on the way to work in the morning. You will surely notice the grace it brings to your life, as promised by Our Lady! Since I have been praying the rosary, 18 months my anxiety is gone and I feel Gods grace in my life. Seeing these 15 promises, has just enlightened my walking in faith together with so many Catholic brothers and sisters. My love for the Blessed Mother Mary, has increased over the past 18 months and I'm sure of her promises through the Fatima miracles. There are so many things in faith that is a mystery. We will never know all the answers until we go to heaven. This is hard to understand but that is what faith is. Going on something you can't see but know in your soul it is the true. Prayer reveals more and more truths of what is right and what is wrong in this world. I have had so many miracles in my life from saying the Rosary. No, I cannot give facts but I can give testimony that there was no reason things changed when they did after the Rosary. My husbands job, my daughter finding the right husband at 38. My daughter having her first baby at 40. 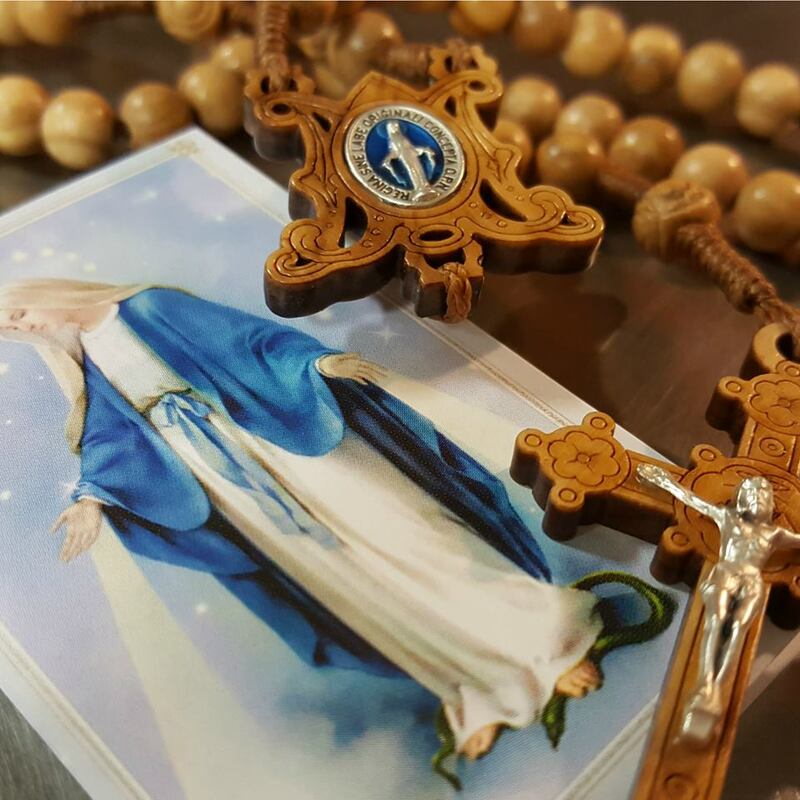 A Rosary for a women who couldn't conceive after 13 yrs and had a baby. She wasn't Catholic but asked me to pray a Rosary for her for this intention. She was pregnant shortly after. She believed it was my prayer. In the second Luminous mystery, Our Lady asked Jesus to fill the jugs with wine. He did what she asked. Jesus listens to his mother. I love God very much, but being a woman, I cannot think of a better role model for women today than Christs mother. I am quite easily distracted while praying rosary like in the sense that I will be mouthing the words but my mind tends to wander round. Anything on that??? I pray all 4 mysteries everyday. Our Blessed Mother interceded for us! I have had SO MANY miracles in my life. My husband was about to be fired for unjust reasons but was instead promoted to manager!! No one will believe but we even received a large amount of money that we did not expect. Please!! Just try it for full week!! Viva Cristo Rey!! Why dont you buy the book SECRET OF THE ROSARY by St. Louis de Montfort and read it. Surely you will change your heart. Show me the exact words of the 15 promises of the rosary in the Bible. Don’t ignore this comment, just show me the exact words of the 15 promises of the rosary in the Bible. Where are Mary’s exact words in the Bible concerning all 15 promises of the rosary. Don’t tell me it is tradition, cause tradition doesn’t support 15 promises according to Jesus. Hi Mary, your comment presupposes the "sola scriptura" view, that only the bible is to be part of Christian belief. This view is an innovation from the framers of the Protestant Revolution. The bible itself does not teach this view, nor was it held in the first 1500 years of Church history. On the contrary, we are to hold fast to the traditions we have been taught, whether *by word of mouth* or by letter (2 Thess. 2:1). That being said, it is not required for Catholics to believe in any private revelation, which is the origin of these 15 promises. 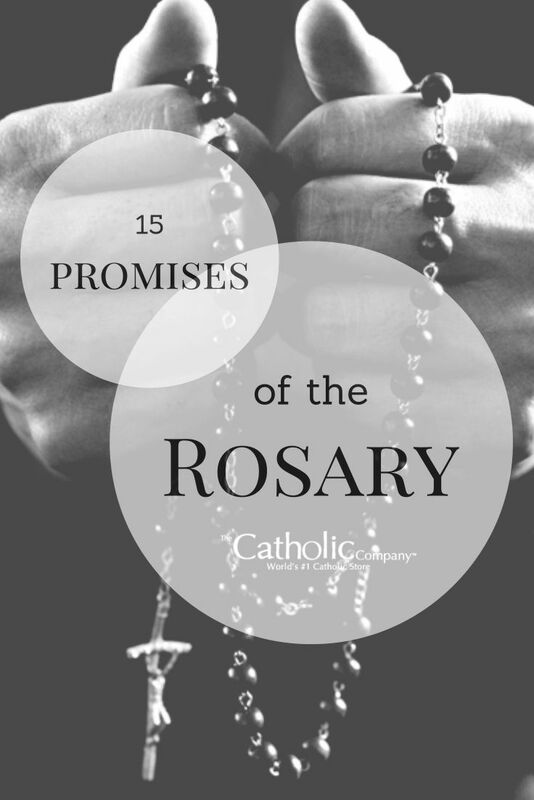 However, the truth of these promises is clear to those who pray the rosary. The Blessed Virgin Mary really and truly works in people's lives in exactly this way. The personal verification is in simply beginning to pray the rosary faithfully and daily to begin to see how she intercedes from heaven for all her spiritual children as the mother of Jesus Christ. In what year was the 15 Promises To Those Who Pray Her Rosary revealed by mama Mary to St Dominic? GOD bless. Thank you Greg for the wonderful explanation of our rosary. Blessed Virgin Mary always intercedes for us, pray the rosary with complete devotion n do well to market mother Mary well at every given opportunity. I was at the state hospital in Denver 11 years ago for something extremely trivial and I contracted the staph infection known as MRSA. I prayed my Rosary every time I got the chance to be able to be cured of this extremely nasty infection. And, as of this year I have been free from the MRSA infection. I also prayed my Rosary each day for almost 13 years in order to be able to leave my now former mental health center, Aurora Mental Health, for the nasty way that they were treating me, ( I was being treated like I was not a human being ! ) , and to be able to get my mental health treatment from a different mental health center. Through Our Blessed Mother's intercession I received the Divine Grace to be able to get my mental health treatment from a different mental health center and I am also now able to take better care of myself through being seen by my new mental health center and through being on the right medications. Thank you, O Most Blessed Virgin, my Heavenly Mother, for your intercession to your Son ! When you communicate with your children or with people around you, do you communicate verbally or thru writing? So are the words of God. Not all the words of God are written in the Bible. Blessed Mother please keep interceding for your children hear on earth. For those who don't believe anything about the Rosary. Do you ever ask your mother to pray or intercede for you, do you intercede on behalf of your own children. For me instead of asking human beings to intercede for me, I will ask my Blessed mother Mary to pray for me. Human beings lied. devoted to the rosary I pray day and night. Using the cell phone, I record myself saying the rosary. When Im walking, driving and every night I fall asleep listening to my rosary. When ever I have "empty" time and alone, I listen to my rosary. She has never failed me and I do my utmost never to fail Her and Her Son, Our Lord. Hello Vickie! Everything that you say about Christ's role, that HE died for us, that HE is the good shepherd, that GOD answers our prayers, is all true. However, Mary is Jesus's mother. As a good and wise mother, her role is to point us to her Son, which she does, in all things! We never pray TO Mary. We only ask that she carry our intentions tenderly in her heart, just as she "pondered all things in her heart" in the Gospel of Luke, and that she bring them before the throne of God and intercede for us, just as the queen mothers of the Old Testament served as intercessors to the king on the people's behalf. 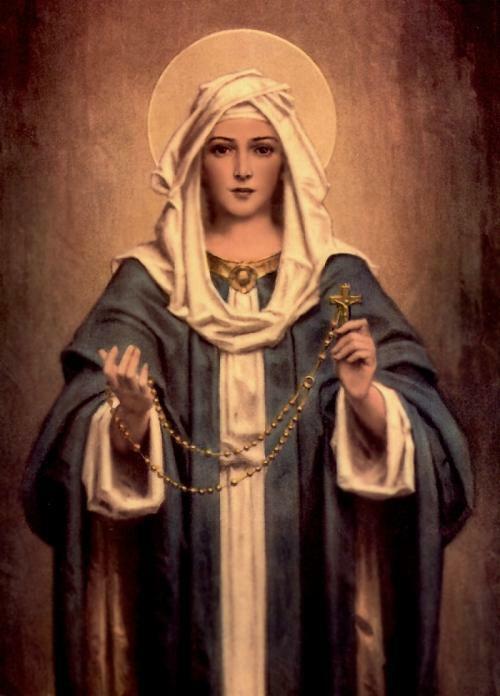 The Rosary, in fact, is a way to meditate on different events of the life of Christ, while walking with Mary, and asking her how to draw closer to God. It is very common for people (Christian and non-Christian alike) to display pictures of their beloved deceased relatives, and to ask for their help or wisdom in difficult moments...if this is a beautiful and good practice, then how much more powerful is it to ask for the aid of Jesus's own mother in this difficult path of growing in holiness? Christ is indeed THE way, the truth, and the life...but we can ask, "How do we know Christ better, in our daily lives?" Mary, as Jesus's mother knew Jesus better than any human being did. I don't know about you, but I can use all the help I can get! I am certainly too weak to know the way simply by my own strength. God bless you Vickie! To be clear, it's dying with *unrepented* mortal sin that lands us in hell, but obviously this is not an excuse to not frequent the Sacrament of Reconciliation and make amends with our neighbor. That aside, awesome post! I love praying the Rosary. Although there is truth to be found outside of the Bible, the Bible is the ruler, if you will, to judge doctrine. Our doctrine MUST line up with the Bible. If doctrine contradicts the Bible, God's Holy word, which many of these promises do, then it is in error. Gretchen, I want to thank you so much for a very enlightening explanations about the Rosary, you make me love Mama Mary more and with it she will lead me closer to her son, Jesus Christ, our King and Saviour. Let us not be afraid to love her too, if God isn't happy if were not at peace with our neighbor, how much more if we're not at peace and loves her Mother? Since I started praying the rosary,my life have not been the same. I have received mercy,kindness and grace through her intercession.She is indeed Holy Mother of Perpetual Help.Please cry to her and she will answer you,Her spiritual intercession is immediate.Seriously you don't have to be a Catholic to ask for her help!